Conflict and negotiation are significant components to operate business. Business possessors may have conflict with many groups like partners, managers, employees and the general public. Negotiation is often essential to develop harmonious solution for all parties involved in the conflict. Many small businesses keep away from internal conflict and negotiation because owners are mainly responsible for completing business functions. However, external conflict and negotiation happen for most companies in the business setting. Conflicting situation often occurs when individuals have dissimilar ideas, beliefs or theories regarding business operations. Business holders may also find conflict when bargaining with individuals or other businesses. Negotiation is the process of talk about each individual position about an issue and tries to get a solution that benefits both parties. Conflict and negotiation are typically more widespread in leading business organizations since more individuals are involved in the company operations. Conflict and negotiation may result in several options being created to resolve difficult situations. Business owners might follow some steps when processing discussion options and solutions; identifying the problem, analysing the issue, creating different strategies or approaches, and acting on outcomes or ideas. These steps provide a logical process to follow when solving conflict and negotiation issues. Conflict: Conflict occurs whenever deviations exist in a social situation over issues of substance. Emotional antagonisms cause frictions between individuals or groups. Traditional view of conflict revealed that all conflicts are harmful and must be avoided. Professionals of the human relations avowed that conflict was a natural event in all groups and organizations. Since conflict was predictable, the human relations discipline supported acceptance of conflict. Supporters rationalized its existence: It cannot be eradicated and there are even times when conflict may promote a group's performance. The human relations scrutiny had dominance on conflict theory from the late 1940s through the mid-1970s. While the human relations approach accepted conflict, the interactionist approach supports conflict on the grounds that a harmonious, passive, calm, and helpful group is prone to becoming static, lethargic, and nonresponsive to needs for transform and innovation. The interactionist approach had great contribution in developing conflict viewpoint and described that conflict is encouraging group leaders to maintain a continuing minimum level of conflict to keep the group practical, self-critical, and imaginative. Katz and Kahn (1978) observed that “every aspect of organizational life that creates order and coordination of effort must overcome other tendencies to action, and in that fact lies the potentiality for conflict”. Conflict in organizations is predictable given that humans therein need to manage their mutual interdependence. According to modern theory, conflicts between human beings are inescapable. They appear as a natural result of change and can be valuable to the organization, if managed competently. Current theory (Kirchoff and Adams, 1982) considers modernism as a device for bringing together various ideas and viewpoints into a new and different fusion. An atmosphere of tension, and hence conflict, is essential in any organization working with new ideas. Ambiguous jurisdiction, which occurs when two individuals have responsibilities which are interdependent but whose work boundaries and role definitions are not clearly specified. Goal incompatibility and conflict of interest refer to accomplishment of different but mutually conflicting goals by two individuals working together in an organization. Obstructions in accomplishing goals and lack of clarity on how to do a job may initiate conflicts. Barriers to goal accomplishment arise when goal attainment by an individual or group is seen as preventing another party achieving their goal. Communication barriers, as difficulties in communicating can cause misunderstanding, which can then create conflict situations. Dependence on one party by another group or individual. Differentiation in organization, where, within an organization, sub-units are made responsible for different, specialized tasks. This creates separation and introduces differentiation. Conflict situations could arise when actions of sub-units are not properly coordinated and integrated. Association of the parties and specialization. When individuals specialized in different areas work in a group, they may disagree amongst themselves because they have different goals, views and methodologies owing to their various backgrounds, training and experiences. Behaviour regulation. Organizations have to have firm regulations for individual behaviour to ensure protection and safety. Individuals may perceive these regulations differently, which can cause conflict and negatively affect output. Unresolved prior conflicts which remain unsettled over time create anxiety and stress, which can further intensify existing conflicts. A manager's most important function is to avoid potential harmful results of conflict by regulating and directing it into areas beneficial for the organization. Conflict can explode when groups differ considerably in power, status, or culture. With reference to power, if dependence is not mutual, but one way, the potential for conflict increases. If party X needs the collaboration of party Y to achieve its goals, but Y does not need X’s assistance, rivalry may develop. Y has power over X, and X has nothing with which to good deal. A good case is the quality control system in many factories. Production workers might be highly dependent upon inspectors to approve their work, but this dependence is not common. The inspectors might have a separate boss, their own office, and their own friends. In this case, production employees might begin to treat inspectors with hostility which shows the symptoms of conflict. Status is also cause of conflict. Status differences provide little movement for conflict when people of low status are dependent upon those of higher status. This is the way organizations often work, and most members are socialized to expect it. Though because of the design of the work, there are occasions when employees with technically lower status find themselves giving orders to, or controlling the tasks of, higher-status people. When evaluating the restaurant business, it can be found that in many restaurants, lower-status waiters and waitresses give orders and begin queries to higher-status cooks or chefs. The latter might come to dislike this problem of usual lines of influence. The initiation of the electronic office also creates conflict. Culture also leads to conflicting situation in organization. When different cultures develop in an organization, the divergence in beliefs and values can result in obvious conflict. Cultures are rooted in conflict because conflicts take place in human relationships. Cultures influence the ways people blame, and attempt to cultivate conflicts. Culture is always a dominant factor in conflict, whether it has major role or influences it subtly and gently. Substantive conflict: A fundamental disagreement over ends or goals to be pursued and the means for their accomplishment. Emotional conflict: Interpersonal difficulties that arise over feelings of anger, mistrust, dislike, fear, resentment. In Intrapersonal conflicts, there are actual or perceived pressures from incompatible goals or expectations. It occurs between two or more individuals who are in opposition to one another. Conflicts can be Approach-approach conflict, Avoidance-avoidance conflict and Approach-avoidance conflict. Intergroup conflict occurs among members of different teams or groups. Interorganizational conflict generally denotes to the competition and rivalry that characterize firms operating in the same markets. It encompasses disagreements that exist between any two or more organizations. After-effects of a conflict situation. Major benefits of functional conflict are that it surfaces important problems so they can be addressed. It causes careful consideration of decisions and causes reconsideration of decisions. It increases information available for decision making and provides opportunities for creativity. At the same time, there are numerous disadvantages of dysfunctional conflict. 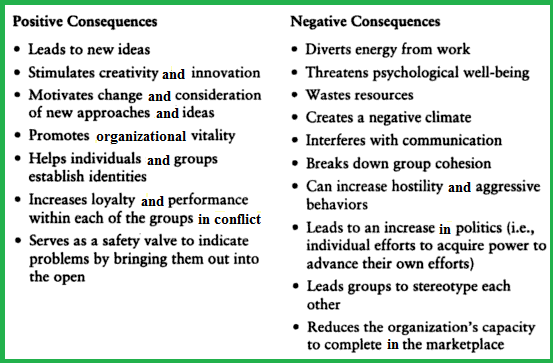 Conflict in organization can diverts energies, harms group cohesion, promotes interpersonal hostilities, creates overall negative environment, can decrease work productivity and job satisfaction. And can contribute to absenteeism and job turnover. Outcomes of conflict in organization: In the context to organizations, conflict is the incongruity between employees, departments, managers or groups of people within the business unit. Disagreements may develop due to differences in opinion, beliefs or detrimental competition that may yield either positive or negative outcomes. Despite of level of conflict, major functional and dysfunctional consequences can occur from conflict. Conflict that results into healthy competition promotes innovation and inventiveness amongst workers. During conflict, there is a high sense of need that results into the appearance of divergent viewpoints amongst employees. It is vital among the employees to develop new policy and operating business to maintain with internal competition from their colleagues. Conflict management: Conflicts are unavoidable in an organization. However, conflicts can be used as motivators for transformation in organization. In business environment, several factors create competition; they may be differing departmental objectives, individual objectives, and competition for use of resources or differing viewpoints. These have to be integrated and exploited powerfully to achieve organizational objectives. A manager should be competent to observe emerging conflicts and take proper preventative action. The manager should recognize the causes creating conflict, the outcome of conflict, and various methods by which conflict can be managed in the organization. In this way, the manager should develop an approach to resolve conflicts before their troublesome repercussions have an impact on productivity and creativity. Therefore, a manager should possess special skills to react to conflict situations, and should create a good atmosphere for communication between conflicting groups. Tosi, Rizzo, and Carroll (1986) developed four ways to manage conflicts. Styles: Conflict managing behaviour styles such as competition, collaboration, compromise, avoidance or accommodation may be properly encouraged, depending upon the situation. Improving organizational practices: When cause of conflict is understood, suitable organizational practices can be used to resolve conflicts such as establishing super ordinate goals, reducing vagueness, minimizing authority and domain-related disputes, improving policies, procedures and rules, re-apportioning existing resources or adding new, altering communications, movement of personnel, and changing reward systems. Special roles and structure: A manager has to begin structural changes needed, including re-location or merging of specialized units, shoulder liaison functions, and act as an integrator to resolve conflicts. A person with problem-solving skills and respected by the conflicting parties can be designated to de-fuse conflicts. Confrontation techniques: Confrontation techniques are intended to explore a mutually acceptable and enduring solution through partnership and compromise. It is executed that conflicting parties are ready to face each other amicably, and entails intercession, bargaining, negotiation, mediation, attribution and application of the integrative decision method, which is a collaborative style based on the premise that there is a solution which can be accepted by both parties. It involves a process of defining the problem, searching for alternatives and their evaluation, and deciding by consensus. It is established that conflict may be understood as fight, war, collision or disagreement. The conflict may be within an individual when there is in-compatibility between his or her own goal and event; may be between two individuals. Many theorists viewed that Conflict is a process that begins when one party perceives that another party has unenthusiastically affected, or is about to negatively affect. Management team of organization should manage conflicts effectively rather than repress or avoid them. Negotiation: Majority of companies have to negotiate in many areas of organizational conflict. Negotiation is an open process for two parties to find a satisfactory solution to a complex conflict. Negotiation is process in which two or more parties exchange goods or services and attempt to agree on the exchange rate for them. In an organizational context, negotiations may take place between two people, within a group, between groups and over the Internet. Negotiation can take extensive forms from skilled negotiator acting on behalf of a particular organization or position in a formal setting to an informal negotiation between friends. Negotiation can be contrasted with intervention, where a neutral third party listens to each side's arguments and attempts to help craft an agreement between the parties. It can also be compared with arbitration, which resembles a legal proceeding. In arbitration, both sides make an argument as to the merits of their case and the arbitrator decides the outcome. This negotiation is also called positional or hard-bargaining negotiation. Basically, negotiation is a problem-solving procedure in which two or more people willingly discuss their differences and try to reach a joint decision on their common concerns. Negotiation requires participants to recognize issues, about which they differ, educate each other about their needs and interests, generate possible settlement options and bargain over the terms of the final agreement. Winning negotiations result in some kind of exchange or promise being made by the negotiators to each other. The exchange may be tangible or intangible. Some disagreement or conflict exists, which may be perceived, felt or manifest. There is some degree of interdependence between the parties. The situation must be conducive to opportunistic interaction. Each party must have both the means and in the inclination to attempt to influence the other. There exists some possibility of agreement, without which the negotiation cannot bring about a positive resolution. Research into negotiation behaviour has mostly been conducted from one of three theoretical traditions that include Individual differences approach, the motivational approach or the cognitive approach (Thompson, 1990). The individual differences approach scrutinizes the types of personal characteristics that affect negotiator behaviour, the negotiation process and the types of outcomes achieved. Research from this perspective might, for example, investigate negotiation behaviour as a function of gender (Walters, Stuhlmacher and Meyer, 1998), culture (Brett, 2000) or experience (Neale & Northcraft, 1986). Motivational approaches search to establish how negotiator aspirations and goals influence bargaining behaviour and the resultant outcomes. Researchers essentially consider the way that certain aspirations for self and other affect outcomes and vary as a result of the negotiation interaction (Wilson & Putnam, 1990). The cognitive approach attempts to determine how individuals construe events and reach judgments about courses of action during negotiation. This approach is grounded in information processing theory (Carroll and Payne, 1991), which essentially posits that, when individuals experience events, stored information is activated in the mind and is then used to reach the next decision. This activation and subsequent processing has been found to occur in an economically efficient manner (Thompson, 1990). Such competence, involves various cognitive shortcuts that impair judgments, thereby limiting a negotiator's effectiveness (Neale and Bazerman, 1991). Negotiation theorists generally differentiate between two types of negotiation. Different theorists explained diverse labels for the two general types and distinguish them in different ways. The negotiator must select a general negotiation approach. There are many procedures, but the most common approaches to negotiation are positional bargaining and interest-based bargaining. First is distributive negotiation, also called positional negotiation. Positional bargaining is a negotiation approach in which a series of positions, alternative solutions that meet particular interests or needs, are selected by a negotiator, ordered sequentially according to preferred outcomes and presented to another party in an effort to reach agreement. The first or opening position represents that maximum gain hoped for or expected in the negotiations. Each following position demands less of an opponent and results in fewer benefits for the person advocating it. Agreement is reached when the negotiators' positions converge and they reach an acceptable settlement range. Major benefits of this approach is that it may prevent premature concessions, useful in dividing or compromising on the distribution of fixed-sum resources, does not require trust to work and does not require full disclosure of privileged information. It tends to approach negotiation on the model of bargaining in a market. In a distributive negotiation, each side often assumes an extreme position, knowing that it will not be accepted, and then employs an amalgamation of cleverness, bluffing, and brinkmanship in order to yield as little as possible before reaching a deal. Distributive bargainers visualize negotiation as a process of distributing a fixed amount of value. Second is integrative negotiation, also known as interest-based or principled negotiation. It is process that attempts to develop the quality and likelihood of negotiated agreement by providing an alternative to conventional distributive negotiation techniques. Interest-based bargaining which involves parties in a collaborative effort to jointly meet each other's needs and satisfy mutual interests rather than moving from positions to counter positions to a compromise settlement, negotiators pursuing an interest-based bargaining approach attempt to identify their interests or needs and those of other parties prior to developing specific solutions. After the interests are identified, the negotiators jointly search for a variety of settlement options that might satisfy all interests, rather than argue for any single position. The parties select a solution from these jointly generated options. This approach to negotiation is frequently called integrated bargaining because of its emphasis on cooperation, meeting mutual needs, and the efforts by the parties to expand the bargaining options so that a wiser decision, with more benefits to all, can be achieved. While distributive negotiation assumes there is a fixed amount of value to be divided between the parties, integrative negotiation often tries to create value in the course of the negotiation. It focuses on the fundamental interests of the parties rather than their arbitrary starting positions, approaches negotiation as a shared problem rather than a personalized battle, and insists upon adherence to objective, principled criteria as the basis for agreement. Business groups choose to negotiate in order to gain recognition of either issues or parties, test the strength of other parties, obtain information about issues, interests and positions of other parties, educate all sides about a particular view of an issue or concern, ventilate emotions about issues or people, change perceptions, mobilize public support, buy time, bring about a desired change in a relationship, develop new procedures for handling problems, make substantive gains and solve a problem. There are many conditions that affect the success or failure of negotiations. Identifiable parties who are willing to participate: The people or groups who have a chance in the result must be specific and willing to sit down at the bargaining table if productive negotiations are to occur. If a critical party is either absent or is not willing to commit to good faith bargaining, the potential for agreement will decline. Interdependence: For prolific negotiations, the contributors must be dependent upon each other to have their needs met or interests satisfied. The participants need either each other's assistance or restraint from negative action for their interests to be satisfied. If one party can get his/her needs met without the collaboration of the other, there will be little impetus to bargain. Readiness to negotiate: Individuals must be ready to negotiate for conversation to begin. When participants are not mentally equipped to talk with the other parties, when sufficient information is not obtainable, or when a negotiation scheme has not been prepared, people may be unwilling to begin the process. Means of influence or leverage: For people to reach an agreement over issues about which they differ, it is necessary that they must have some ways to influence the attitudes and behaviour of other negotiators. Often influence is seen as the power to intimidate or inflict pain or unwanted costs, but this is only one way to support another to change. There are numerous ways to influence in negotiation over issue such as enquire thought-provoking questions, provide needed information, to get the advice of experts, appealing to influential associates of a party, exercising legitimate authority or providing rewards. Agreement on some issues and interests: People must be able to agree upon some common issues and interests for good negotiations. Generally, participants will have some issues and interests in common and others that are of concern to only one party. The number and importance of the common issues and interests influence whether negotiations occur and whether they stop in agreement. Parties must have sufficient issues and interests in common to do themselves to a joint decision-making process. Will to settle: In order to have successful negotiations, contributors have to desire to settle. If conflict is continued instead of settlement, then negotiations are bound to failure. Often parties want to keep conflicts going to preserve a relationship, to mobilize public opinion or support in their favour, or because the conflict relationship gives meaning to their life. These factors encourage continued division and work against settlement. The harmful consequences of not settling must be more significant and greater than those of settling for an agreement to be reached. Unpredictability of outcome: People bargain because they need something from another person. They also negotiate because the outcome of not negotiating is unpredictable. Chances for a crucial and one-sided victory need to be unpredictable for parties to enter into negotiations. A sense of urgency and deadline: Negotiations normally occur when there is pressure or it is critical to reach a decision. Urgency may be imposed by either external or internal time constraints or by potential negative or positive consequences to a negotiation outcome. External constraints include; court dates, imminent executive or administrative decisions, or predictable changes in the environment. Internal constraints may be artificial deadlines selected by a negotiator to enhance the motivation of another to settle. For negotiations to be successful, the participants must jointly feel a sense of urgency and be aware that they are vulnerable to adverse action or loss of benefits if a timely decision is not reached. If procrastination is beneficial to one side, negotiations are less likely to occur, and, if they do, there is less impetus to settle. No major psychological obstacle to settlement: Strong expressed or unexpressed feelings about another party can sharply affect a person's psychological willingness to bargain. Psychological barriers to settlement must be lowered if triumphant negotiations are to occur. The people must have the authority to decide: In order to obtain successful outcome, participants must have the power to make a decision. If they do not have a lawful and recognized right to decide, or if a clear approval process has not been established, negotiations will be limited to an information exchange between the parties. Willingness to compromise: It is found that all negotiations do not require compromise. On occasion, an agreement can be reached which meets all the participants' needs and does not require a sacrifice on any party's part. However, in other disputes, compromise willingness to have less than 100 percent of needs or interests satisfied may be necessary for the parties to reach a satisfactory conclusion. Where the physical division of assets, strong values or principles preclude compromise, negotiations are not possible. The agreement must be rational and be implemented: Some settlements may be substantively acceptable but may be impossible to implement. Participants in negotiations must be able to establish a realistic and workable plan to carry out their agreement if the final settlement is to be acceptable and hold over time. External factors favourable to settlement: Often factors external to negotiations hamper or promote settlement. Views of associates or friends, the political climate of public opinion or economic conditions may promote agreement or continued chaos. Some external conditions can be managed by negotiators while others cannot. Favourable external conditions for settlement should be developed whenever possible. Resources to negotiate: Members in negotiations must develop interpersonal skills required for bargaining and, where suitable, the money and time to engage fully in dialogue procedures. Insufficient or imbalanced resources may block the beginning of negotiations or obstruct resolution. Preparation and Planning: Before the start of negotiations one must be aware of conflict the history leading to the negotiation the people involved and their perception of the conflict expectations from the negotiations etc. Definition of Ground Rules: Once the planning and strategy is developed, one has to begin defining the ground rules and procedures with the other party over the negotiation itself that will do the negotiation. Where will it happen? What time constrains, if any will apply? To what issues will negotiations be limited? Will there specific procedure to follow in an impasse is reached? During this phase the parties will also exchange their initial proposals or demands. Clarification and Justification: When initial positions have been exchanged, both the parties will explain amplify, clarify, bolster and justify their original demands. This need not be confrontational. Rather it is an opportunity for educating and informing each other on the issues why they are important and how each arrived at their initial demands. This is the point where one party might want to provide the other party with any documentation that helps support its position. Bargaining and Problem Solving: The essence of the negotiation process is the actual give and take in trying to hash out an agreement. It is here where concessions will undoubtedly need to be made by both parties. Closure and Implementation: The final step in the negotiation process is formalization the agreement that has been worked out and developing and procedures that are necessary for implementation and monitoring. For major negotiations, this will require hammering out the specifics in a formal contract. There is a major role of mood and personality traits in Negotiation. Positive moods optimistically affect negotiations. Traits do not appear to have a considerably direct effect on the outcomes of either bargaining or negotiating processes. There are also gender differences in Negotiations. Women negotiate no differently from men, although men in fact negotiate better outcomes. Men and women with similar power in organization use the same negotiating styles. Women’s attitudes toward negotiation and their success as negotiators are less favourable than men. Challenges in negotiation: The negotiation approaches are intended to benefit organization but sometimes it is difficult to reach to a conclusion and satisfy all parties. There are many challenges faced by parties to negotiation and it is necessary to overcome them to effectively operate business. The main challenge to negotiation is when individuals are not ready to understand the second party at all. There are individuals who only think about their interests and tend to ignore the interest and needs of the other. It is important to find out the expectations of the other party as well. For business negotiation, managers will definitely be appreciated if employee saves organization’s money. Lack of time is also challenge to effective negotiation. One should never be in a hurry. Person need time to convince others. It is advised to analyse things carefully and then only come to conclusions. Going unprepared for a negotiation is intolerable. It is said that don’t underestimate the second party. One should do his homework carefully. Check out even the smallest details before going for a negotiation. Lack of patience also leads to a bad negotiation. Every individual has the right to express his views and one should not interfere in his speech. People might not agree to him but at least listen to him first. Sit with the second party and make him realize how the deal would benefit you as well as him. Criticism, sarcasm, derogatory remarks are the major threats to a successful negotiation. Never ever say anything which might hurt others. It is advised to avoid last minute changes as it result in confusions and misunderstandings. The two parties must be very clear on what they expect from each other, and must stick to it. Being too rigid is one of the prime challenges to an effective negotiation. Negotiator must be little flexible. Stay alert while individual is negotiating. Lack of confidence is again major threats to negotiation. Many people label negotiation as a formal process of good deal between labour and management or purchaser and seller. Nevertheless, negotiating is more than this concept. Job applicants negotiate for their salary, workers bargain for better job projects. To include all of these situations, it can be explained that negotiation is "a decision-making process among interdependent parties who do not share identical preferences." Negotiation comprises conflict management in that it is an effort either to avert conflict or to resolve existing conflict. Negotiation is an attempt to gain a reasonable exchange among or between the parties. Successful negotiating needs good knowledge of techniques. To summarise, Negotiation is the most powerful approach to make decisions and manage disputes in organization. Negotiation is among the most commonly utilized modes of conflict resolution. Negotiation strategies are grouped as being either distributive or integrative. Many research studies have demonstrated that these different approaches to negotiation regularly lead to vastly different behavioural and attitudinal outcomes. Cognitive descriptions do not enable persons to fully comprehend nor internalise these distinctly different approaches to negotiation. Therefore, there exists a need to develop and use negotiation simulations to meet these objectives.